Created by students and studio leaders in 2016’s experimental Wind Architecture studio, The Hex Kite has won the Platinum A' Design Award at the at international A’Design Award and Competition. The 12 metre inflatable structure was created using computational techniques more commonly associated with describing natural growth in plants. This approach allowed students to design rules that can guide the growth of whole families of objects. Like living creatures evolving through natural selection, members of such families can adapt to diverse needs and conditions leading to outstanding efficiency, unimaginable forms and aesthetic enjoyment. Kites can be interesting for architects because they tame a powerful energy source with minimal means to achieve amazing, and sustainable, performance. What if buildings could be supported by the available wind, just like kites? 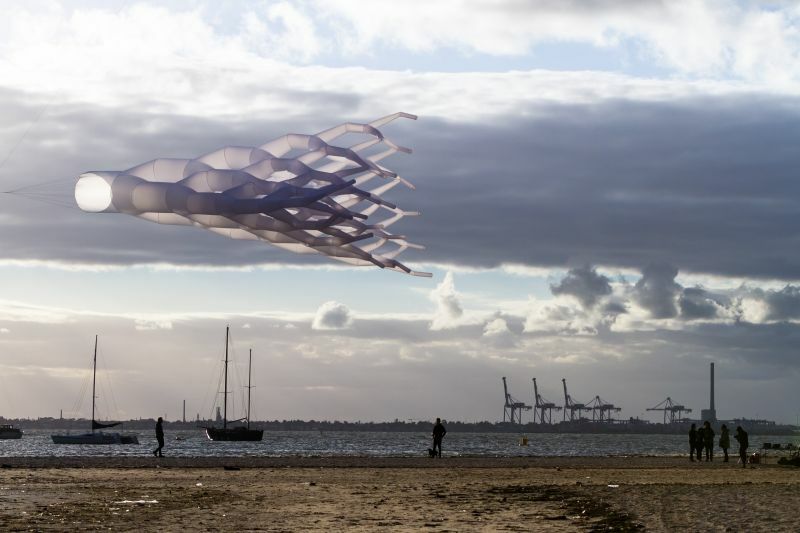 What can kites teach architects about the invisible landscapes of air? These are the types of questions asked by the broader ongoing research that motivated this project. The Platinum A' Design Award is a prestigious award given to top 1% percentile designs that has attained an exemplary level of sublimity in design. Entries to the A' Art Design Awards are peer reviewed and anonymously judged by a grand jury panel of prominent academics, important press members and experienced professionals. Nominated art designs are voted on pre-determined evaluation criteria to highlight only the leading art design works.